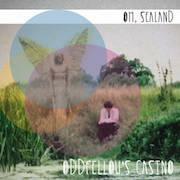 Essentially the project of one David Bramwell, a northerner relocated to Brighton, Oddfellow's Casino have released seven albums in their 15-year existence and take their name from Ambrose Oddfellow, a Victorian freakshow host whose moustache Bramwell inherited from a great-aunt. The author of several books focussing on notable eccentrics and regional oddities, and the creator and presenter of quirky documentaries for BBC Radios 3 and 4, Bramwell found a kindred spirit in John Higgs, whose most recent book, Watling Street, explores notions of Britishness by way of the country's oldest road and the events that occurred along its route. Higgs commissioned Bramwell to write a song to accompany the book, and 'The Ghosts of Watling Street' forms the centrepiece of this album. It also features a spoken-word contribution from the great Alan Moore, who intones, "We have wandered too far from some ancient totem - something central to us, that we must find our way back to." Oh, Sealand is clearly concerned with the question of Britain, but avoids any easy answers. Its clearest statement comes in the opening track, 'Land of the Cuckoo', where over ominous, pulsing bass, Bramwell sings: "There's a fox in the schoolyard/ they're in the hospitals now" in a barely veiled warning against allowing profit-focussed corporations to insinuate themselves into essential public institutions. The song 'Sealand' is described as an unofficial anthem for the independent principality of Sealand, the micro-nation founded on a disused Maunsell Sea Fort seven miles off the Suffolk coast. Seized from rival pirate radio broadcasters in 1967, its story is one of dubious and desperate free enterprise combined with English eccentricity at its most belligerent and aggressive. If the track sounds more like a lament for lost dreams than a celebration of island utopias, the line "We'll take this land by force" undermines any idealistic ideas about Sealand's history. Instead the song raises the question of what exactly constitutes a nation, and draws implicit parallels with the larger island this libertarian outpost in the North Sea defines itself against. Musically, Oddfellow's Casino deals in tuneful, anglocentric and mildly experimental electro-acoustic pop that joins the dots between Pentangle and The Pet Shop Boys, Basil Kirchin and British Sea Power. There are echoes too of the literate, introverted indie of Animals That Swim or The Lilac Time. 'The Ghosts of Watling Street' is the album's most radio-friendly moment, riding a confident and catchy guitar riff and a bucolic melody worthy of Fried-era Julian Cope: you barely notice the missing chorus, which just never arrives. The seven-minute 'Down in the Water' is the other strong pop moment, enlivened by Rachel James's soulful vocals, Numan-esque synths and a stomping glam rhythm. Images of drowned villages and people sleeping underwater become Jungian totems of sublimated sexuality. 'Swallow The Day' is pastoral psychedelia of the lightest kind, while 'Danu' is a spoken-word piece following the course of the River Don over a bed of electronic drones and sparse piano. The determined fuzz bass of 'Children Of The Rocks' contrasts with the unadorned piano and plaintive vocals of 'Josephine', a simple love song that uses imagery of the English landscape to convey its emotional message. Matters come to a head on 'Penda's Fen', which expands on the themes of Alan Clarke's justly acclaimed 1974 BBC film - itself a complex allegory of history and sexuality, folklore, fantasy and family ties - to become a song about conflicted feelings of national identity. Beneath the motorways and factories, the politics and the patriotic posturing, there remains something older and primal. 'I am your son," Bramwell sings, over an uncharacteristically squalling electric guitar riff, "how can I show my love?" Do we have to go back to go forward? Is it necessary to reclaim the Britain of Blake and Boudicca from the flag-waving xenophobes, or are all notions of nationality best left behind as we progress into a future where borders become irrelevant? Is Sealand something worth fighting for? John Higgs recently defined the opposite of terrorism as wonderism: affecting change through deliberate acts of joy and wonder. Oh, Sealand is a wonderist intervention in the name of a different definition of Britain: one where mystery is currency and love, rather than fear, is what unites these islands' disparate tribes.